FIRST ANNUAL LIVE AND PRACTICE | 59 The Interview ISSUE Call of the wild: 4 towns that embrace the great outdoors SUMMER 2013 Becoming a physician is hard. Finding a job doesn't have to be. 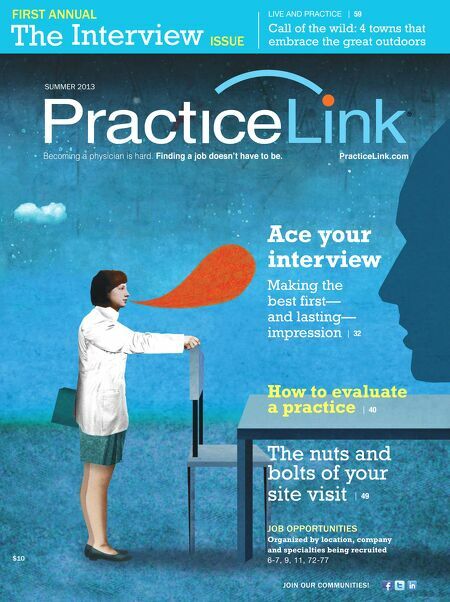 PracticeLink.com Ace your interview Making the best first— and lasting— impression | 32 How to evaluate a practice | 40 The nuts and bolts of your site visit | 49 JOB OPPORTUNITIES $10 Organized by location, company and specialties being recruited 6-7, 9, 11, 72-77 JOIN OUR COMMUNITIES!